Key Concept: Covers large numbers including thousand, million and billion. 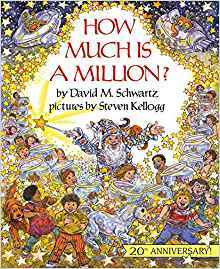 Description from the publisher: Mathematician David M. Schwartz and illustrator Steven Kellog join forces to knock complex numbers down to size, with some help from Mavelossissimo the Mathematical Magician. It’s a math class you’ll never forget.